Chancho Elementary School , located in Finfinne surrounding, Oromiya Region Special Zone, Sululta Woreda, Chancho town, remains closed since yesterday after nearly 200 students experienced sudden (and so far mysterious) collapse yesterday afternoon. 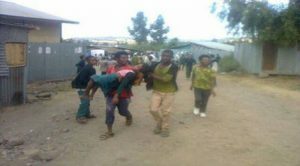 Pictures of young and unconscious students being carried away from the school compound yesterday afternoon found its way to the social media; one particular picture (above) of an unconscious young girl sent a shockwave through social media activists who are trying to bring the plight of unarmed Oromo students protesting the Addis Abeba Master Plan but are met with excessive police crackdown. It was widely reported on Facebook and Twitter that the students in Chancho town were also suffering from police crackdown as was the case in several cities in the Oromiya regional state for the last two weeks. The collapsed students were taken to St. Pawlos Hospital in the capital. According to the Deputy Principal, among those who collapsed was a teacher. The students were discharged from the hospital and returned home after receiving mainly “counseling and psychological treatments,” according to Asnakech. Commander Jemal of the local police force maintains that the police were instrumental in helping the students go to the hospital. “We haven’t got the report from the hospital yet. As a result we cannot ascertain what has happened. But there was no violence of any kind,” he told Addis Standard. The commander estimates the collapsed students to be between the ages of nine and fifteen. Chancho elementary school has more than 1000 students.